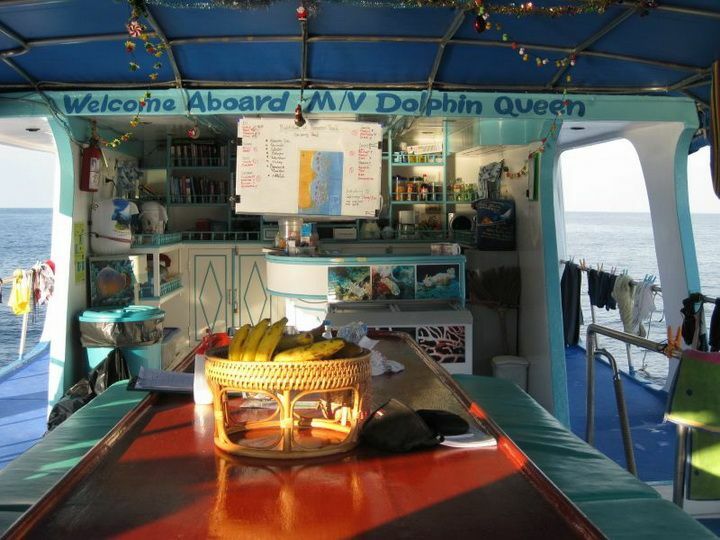 MV Dolphin Queen is the best budget Burma liveaboard. It has a strong pedigree having pioneered diving in the area and it still visits some secret dive sites that other boats don’t know about. Dolphin Queen is a wooden monohull vessel, not a fancy boat but it’s professionally run by friendly staff. The cabins are compact and do not have en-suite bathrooms but they do have air conditioning and charging sockets for your electronics. The food always gets good reviews too. All except two cabins are on the main deck. The two double cabins on the upper deck are slightly larger. 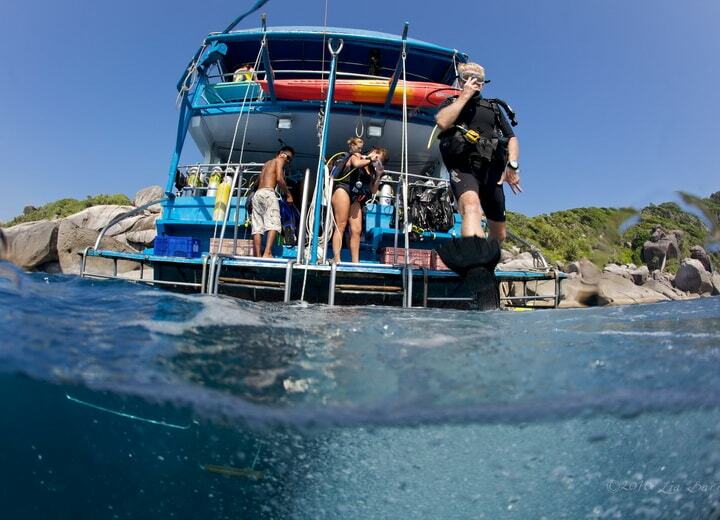 Rental dive equipment is included in the price but if you have your own you get 1,000 baht discount. Book with just 20% deposit and pay the balance when you arrive in Khao Lak. “Dive Leader’s briefing was thorough and comprehensive before each dive. 1 twin bed cabin and 3 quad cabins. All with AC. 20% discount for non diving partners. 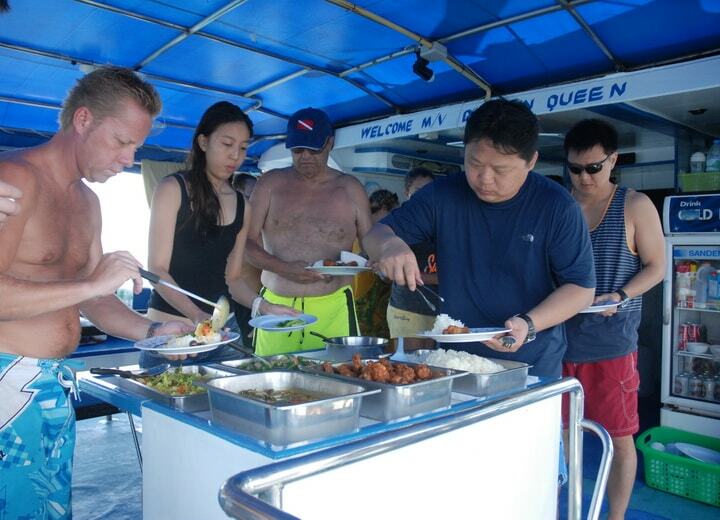 Dive guide, tanks, weights & belt, dive light for night dives, all meals. 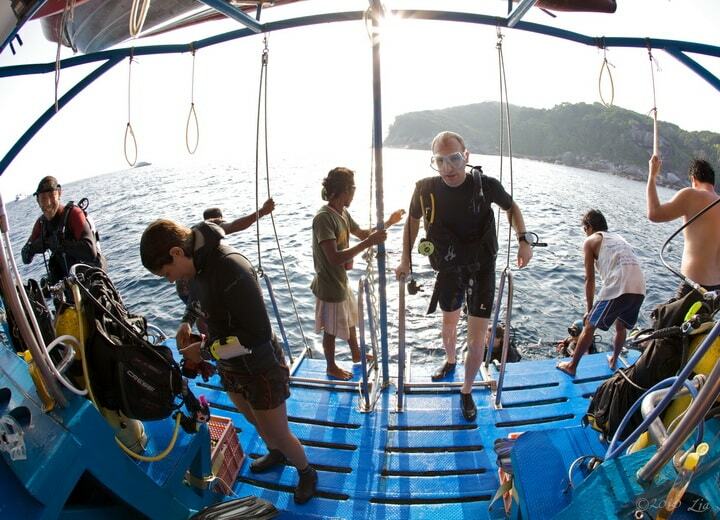 Alcohol, cans of soft drinks, towels, Nitrox (200 baht per fill), dive equipment, Mergui entry fees (US$230 per person), dive insurance, transfers to the dive centre. Note: If you have not dived for over a year you will need to do a refresher before joining a cruise. You must also be advanced or deep diver certified. 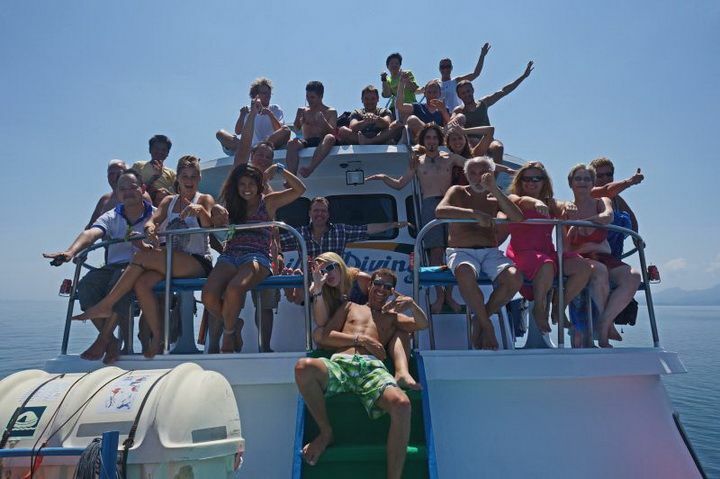 If not you can do a PADI Adventure Deep Dive (1,500 baht) as the first dive of the cruise. How to book this liveaboard: Tell us which trip you want to book and we’ll send you a booking form with instructions for payment. We accept online payment by credit card or paypal. We also accept bank transfers. For advance bookings pay just 30% deposit now to confirm your place, the balance is due on arrival. 0730-0900 hrs: Arrive at the Khao Lak dive centre for check in and equipment fitting. 0900-1230 hrs: Transfer by AC minivan to Ranong. 1230 hrs: Board Dolphin Queen in Ranong. Lunch on board. Then Thai immigration control and exit Thailand. 1430 hrs: Arrive Kawthaung. Myanmar immigration control. 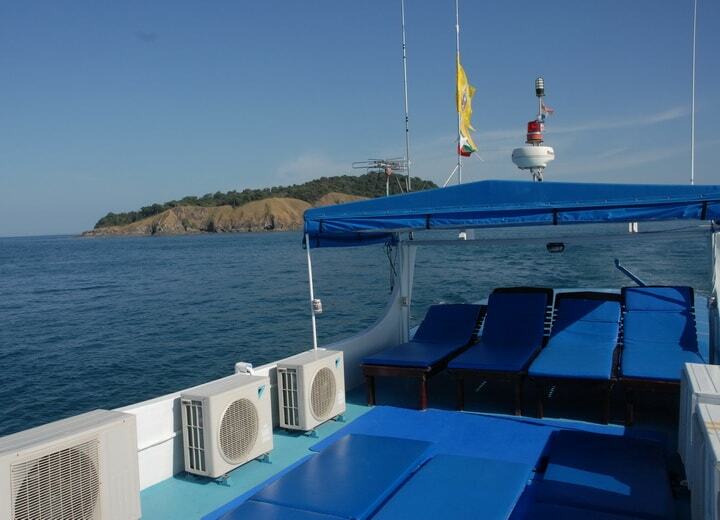 Then cruise in to the Mergui archipelago. Dinner served on board. 4 dives around the 3 Islets dive sites. Afternoon Island excursion to visit a Moken village. 4 dives at Black Rock. 3 day dives at Stuart Rock, Rainbow Rock and Castle City. Night dive or beach excursion. Dive 1 at Frog Rock. Dives 2 and 3 at Candy Canyon. Plus dusk/night dive. Dive 1 at Fan Forest pinnacle. Dives 2,3 and 4 at Western Rocky. Morning dive at Shark Lagoon. Then cruise back to Kawthaung. 1330 hrs: Arrive at Kawthaung and complete immigration procedures to exit Myanmar. 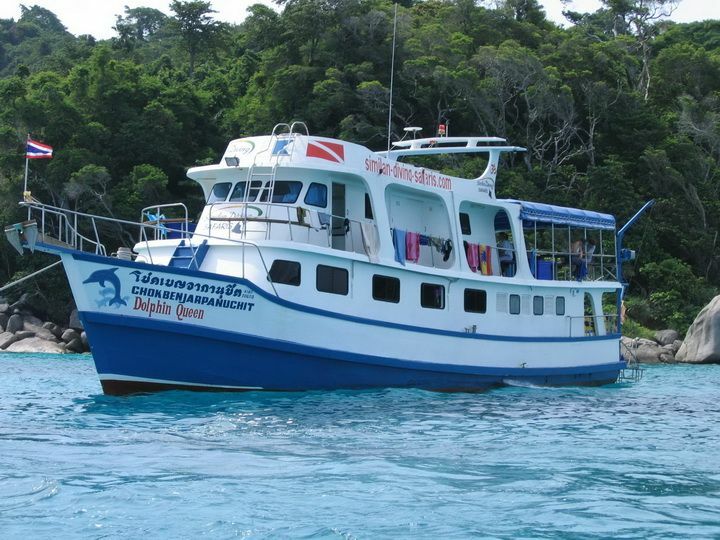 1530-1830 hrs: Disembark Dolphin Queen and transfer back to the Khao Lak dive centre. Note: This itinerary is a guide only and may be changed due to weather or sea conditions for your safety. next season schedule coming soon..